Sierra Leone’s Presidential Flag-bearer aspirant for the opposition Sierra Leone’s Peoples Party (SLPP), Dr. Kandeh Kolleh Yumkella, has been awarded the 2015 Development Champion Award in absentia in Brussels, Belgium, in recognition of his outstanding commitment and contributions to African development. The award will be handed personally to Dr. Yumkella (Photo) at a date to be determined. Kandeh was noticeably absent at the ceremony in Brussels, because he was in Houston, Texas, attending his party’s convention in the USA, where he is reported to have wowed party stalwarts with his speech and developmental plans for his native, Sierra Leone. In 2014, former AfDB President, Dr. Donald Kaberuka, was the recipient of the 2014 Development Award. We will bring you more news on this, when Dr. Yumkella picks up the award in Brussels. Bio was too busy engaging in social mobilization for his new boss EBK. If the SLPP gives this man any serious consideration to become their flagbearer again, they deserve to spend eternity in opposition. It is the APC’s modus operandi to compensate those who support them in nation wrecking. Maada Bio doesn’t care which party the money comes from and he has clearly come for an APC payday. 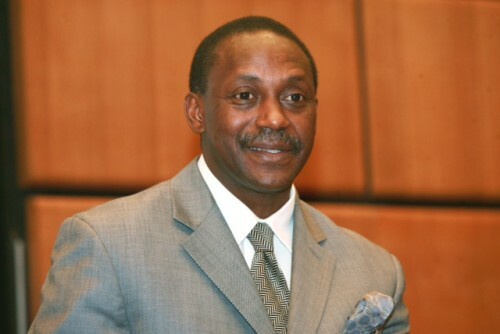 The good doctor Kandeh Yumkella in Texas to attend the SLPP’s convention in the USA? Oh dear, when (if ever) will the good Maada Bio be able to do likewise? Last attempt, Uncle Sam slapped a travel ban on him because he carries unpleasant-smelling baggage.